The planet Venus sparkles as a bright point of light, seen through the rings of Saturn, in this image from NASA's Cassini orbiter. Venus is the speck just above and to the right of the image's center. The picture was captured on Nov. 10, 2012. 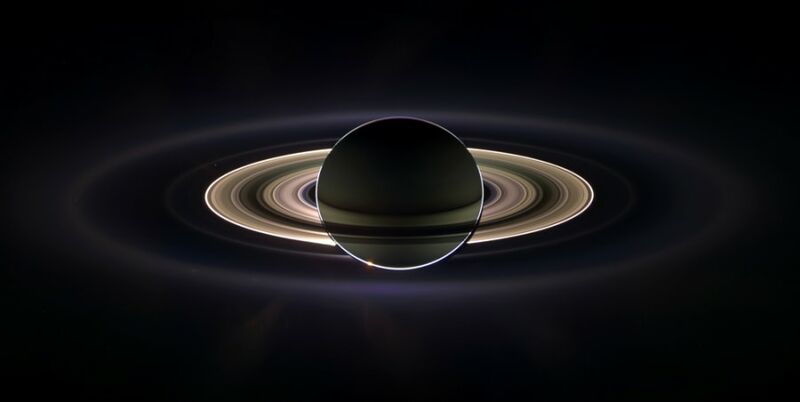 NASA's Cassini spacecraft has been sending us eye-filling pictures of the giant planet Saturn for almost nine years, but every so often, the camera also sees the small fry of the solar system — such as Venus, which shines in the two latest offerings from the Cassini imaging team. One of the photos, captured last November, shows Venus as seen through Saturn's gossamer rings, from a distance of 884 million miles (1.42 billion kilometers, or 9.51 AU). The other picture highlights Venus as a "morning star," hanging just beyond Saturn's edge and next to the giant planet's G ring. Venus was 849 million miles (1.37 billion kilometers, or 9.13 AU) away when that picture was taken in January, according to the imaging team. From such a distance, Venus looks like nothing more than a bright speck. Which isn't surprising, considering that Earth takes on pretty much the same appearance from Saturn, even though it's slightly bigger. The mind-boggling perspectives involved in space vistas led the late astronomer Carl Sagan to call our home planet a "pale blue dot," and I guess that makes Venus a pale yellow dot. "Along with Mercury, Earth, and Mars, Venus is one of the rocky 'terrestrial' planets in the solar system that orbit relatively close to the sun," she wrote. "It has an atmosphere of carbon dioxide that reaches nearly 900 degrees Fahrenheit (500 degrees Celsius), a surface pressure 100 times that of Earth's, and is covered in thick, white sulfuric acid clouds, making it very bright. Despite a thoroughly hellish environment that would melt lead, Venus is considered a twin of our planet because of their similar sizes, masses, rocky compositions and close orbits. "Think about Venus the next time you find yourself reveling in the thriving flora, balmy breezes, and temperate climate of a lovely day on Earth, and remember: You could be somewhere else!" Dawn on Saturn is greeted across the vastness of interplanetary space by the morning star, Venus, in this image from Cassini. Venus appears just off the edge of the planet, in the upper part of the image, directly above the white streak of Saturn's G ring. Lower down, Saturn's E ring makes an appearance. A bright spot near the E ring is a distant star. This picture was captured on Jan. 4, at a distance of about 371,000 miles (597,000 kilometers) from Saturn. The Cassini spacecraft is sending back unprecedented imagery of Saturn, its rings and its moons. Click "Launch" to see some of the greatest hits from the Cassini mission.